The main problem with the Road to Gold race being a confidence buster was that the very next weekend I had the Rock-n-Roll DC half marathon on tap, which I originally hoped would be a PR attempt. It came a little earlier in the season than last fall’s half PR but in January, in my optimistic, goal-writing state, that didn’t matter. Road to Gold would be a stepping stone to tell me I could handle that pace at the half. But when that race went south, I wasn’t left with much to go on. The first part of Road to Gold was the only time I held sub-6 minute pace for longer than a mile all season, and after that I completely fell apart. So going out faster than 6-minute pace for the half seemed dumb. I figured a decent plan was to start around 6:00 until the big hill just after mile 6, then try to cut it down or do whatever I could at that point. With that kind of start I’d need to run sub-5:50 from halfway to the finish to PR, and I couldn’t convince myself that was possible. (My PR is 1:17:26, 5:54 pace.) So “whatever I can do” became the vague goal that let me off the hook a little. It was a telling sign my confidence was shot. The trouble is, when I’m not going for a PR, my mental game suffers. I’m in this nebulous zone where I don’t know what would be a good effort on the day or whether I’m giving myself excuses from the start and cutting myself too much slack. And in the final miles of a race, it’s really hard not to have a tangible goal to grasp on to/to pull you forward. But without any real idea of where I was, I had no better plan. But I found a pack of two women I knew and we started hitting 6 flats, so I was running according to plan. I was still mentally questioning myself way too much for so early in a race, but I told myself to stay with the women and work with them. It’s early still. I’m not hurting, I’m just letting doubts and fear in for no reason. I tried to relax until we got to the hill, which I felt like we crawled up: are my legs even moving?? But the two women I was with dropped back a bit so maybe I survived it slightly better. 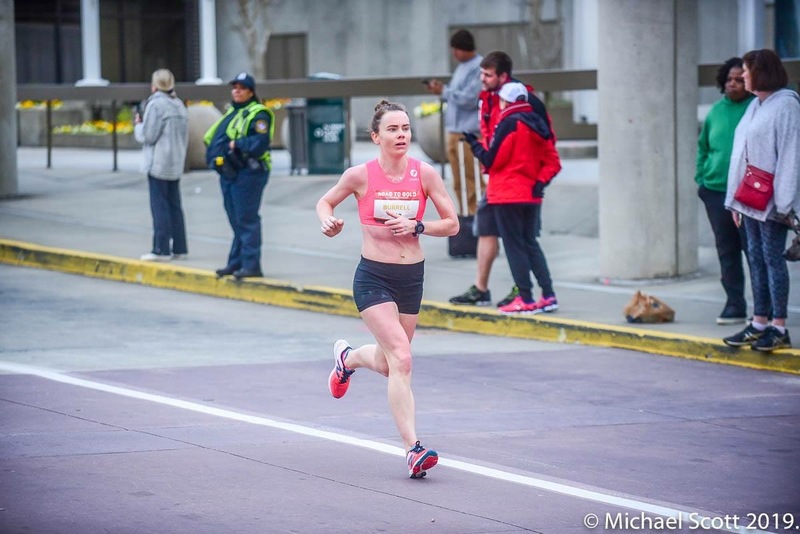 I passed another woman before the next mile marker and was starting to feel more positive. 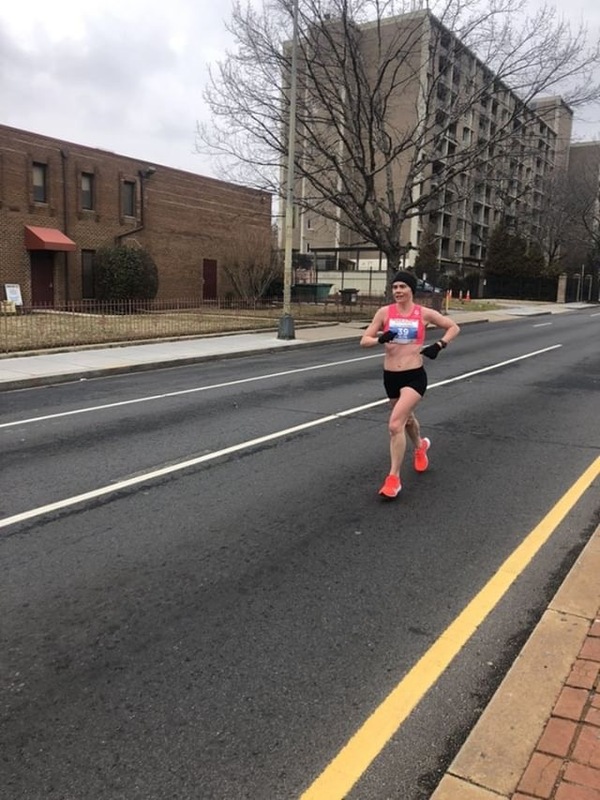 My split for the hill mile was 6:23, but I knew from the past that although I often lose 20-30 seconds in that mile, I make it up on the downhills later on. The next section rolls a bit and I tried to embrace the hills. (I’m a strength runner! Hills are my jam!) I felt strong and saw my sister who told me in was in fifth. I saw a ponytail ahead and thought I could surely reel her in. Around mile 10. Photo by Caitlyn Tateishi. Just after mile 8, Shauneen, one of the women I had been running with earlier, caught me. We had run together on GRC so I knew how tough she is. I tried to stay with her and was shocked when I actually could. I was telling myself the hills were helping me more (not sure why I thought this, maybe because I originally dropped her on the biggest hill) and that bold assertion helped me stay with her. We dropped a 5:50 on a rolling ninth mile and were back on 6-flat pace. But just before the tenth mile marker and the biggest downhill, I let her go. I think I got scared of the pace or gave myself the excuse that the downhill would help her more. This is my biggest regret of the race, because I had been surprised when I didn’t immediately let her go at mile 8, that I was capable of staying with her and it wasn’t killing me. But eventually I let fear get the better of me. Mile 10 was a 5:42. (That mile has the most downhill, but that’s probably the fastest split I’ve run in any race ever.) I watched Shauneen reel in the woman in front of her and was confident I could get her too. The countdown began: just get to the spot where Husband and Daughter are cheering (mile 10.5). Ok, big cheer, lots of love, check. Now get to Cowbell Corner (mile 11.5). Lots more love, lots more cheering (the Oiselle team is LOUD y’all), check. There’s a slight uphill there, as my Oiselle teammate Courtney had reminded me, and while I definitely felt it, I still felt strong. Until all of a sudden, I didn’t. I was tying up left and right and struggling to keep it together. My split for mile 12 (after four solid miles) was a 6:09, the second slowest of the day. 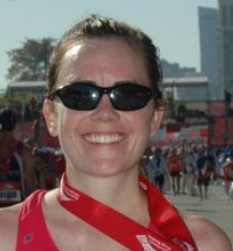 I finished in 1:18:13 and sixth place. It’s my second fastest half and a course PR, but it felt… just okay. It was certainly better than the previous week’s race (I ran a faster pace for 5 miles longer) but it was far from where I wanted to be at this point. I had hoped to run the full marathon at close to that pace in just five weeks. That doesn’t seem possible now. Is a PR even possible? I’m not sure. Like I said above, I really struggle in the no-man’s-land of not going for a PR. I just have no desire to go into a marathon, having done all this work, without the intention of going for it. So the realization starting to dawn on me really began to bum me out. 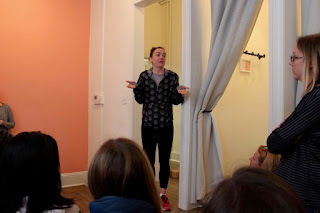 But the weekend’s activities were far from over: there was brunch with the Oiselle team, dinner and drinks with GRC friends and babies, and on Sunday morning I got to go to an event at Summit to Soul, a woman-owned specialty store in DC. They recently launched a partnership with Oiselle which means you can now buy more #flystyle there than anywhere in the country, besides Oiselle’s flagship store in Seattle. (So if you’re in DC, I highly recommend you check it out. And if you live in DC, join them for their weekly Wednesday night runs!) I gave a talk about my running journey and how big I dared to dream, how much I had to believe in myself and how far I’ve come because of that dreamy ambition. I tried to stress that God has given all of us so more much potential than we know, because I truly believe that. Talking at Summit to Soul. Photo by Samantha Giordano Kim. … Maybe it was a talk I needed to hear myself. 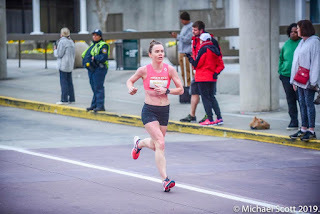 Maybe my early season goals were a little far-fetched (shocker, I know), maybe the odds are long, but all I can do is my best in the remaining workouts and then spend the taper as I always do: trying to shore up belief in myself, my training, and that it will all come together on April 15. 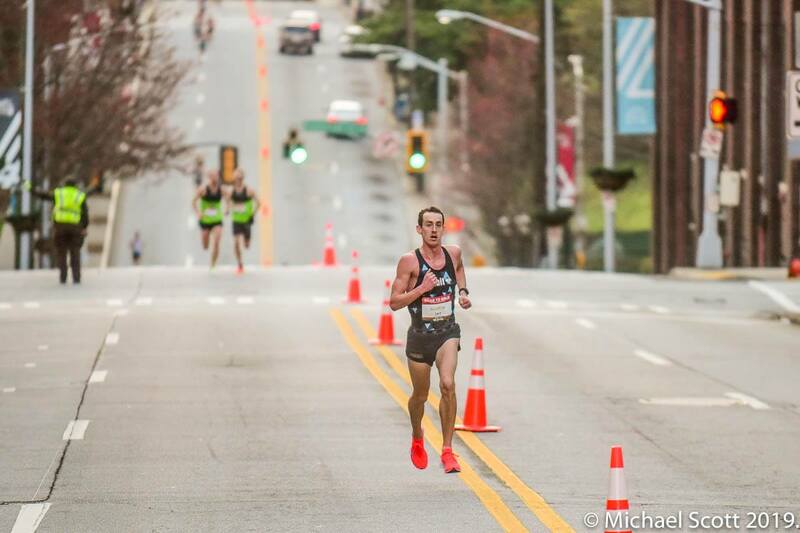 This past weekend I got to go to Atlanta to run Road to Gold, a test race on the 2020 Olympic Trials course. 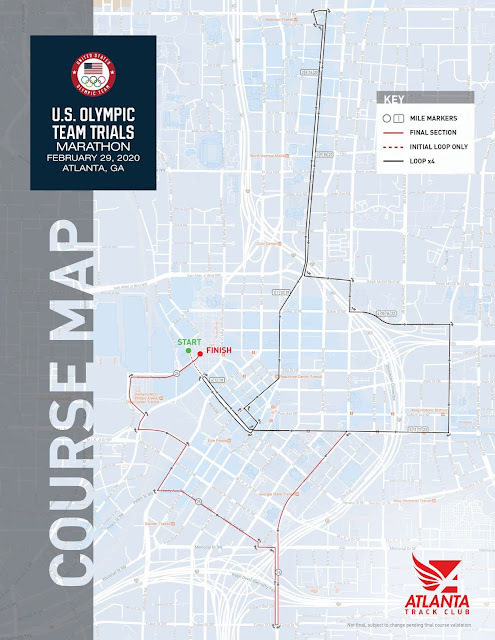 The Trials course will be four laps: a 6-mile loop run three times and a final lap covering most of that loop before heading south for the final 2.2 miles. 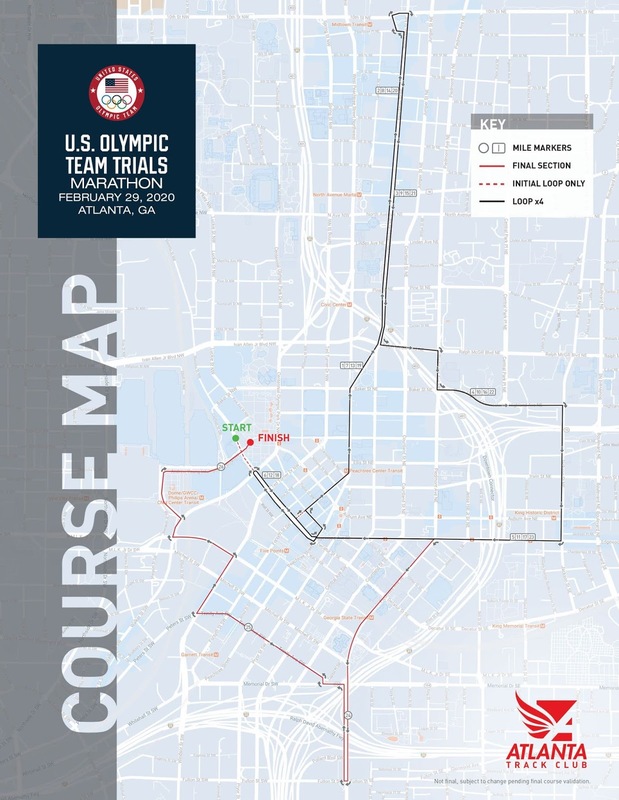 Atlanta Track Club invited all qualified athletes to come run most of the last lap (an 8-mile race) to get a feel for what the course will be like. It was both a scouting mission and an opportunity for a tune-up race/hard workout. First, the scouting mission. Here’s what we learned about the Trials. 1. The course is HILLY. That’s been the main theme of the press since the route was revealed, but I was hoping it might be over exaggerated. IT IS NOT. Even the flat sections (the first out and back we’ll hit on every loop) don’t feel all that flat: it felt like we were always going slightly up (which is annoyingly grating) or slightly down (which is either imperceptible or not that satisfying). It turns out the best downhill is in this section (heading north from mile 1-2) but I didn’t really notice it. 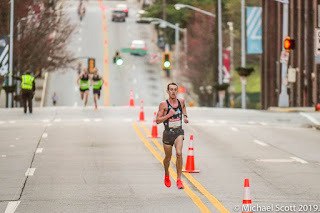 The locals kept saying it’s “Atlanta-flat” (they did remove sections of Piedmont Park to make it flatter), but I was comforted when other athletes agreed "Atlanta-flat" is actually crazy hilly. a photo that gives a good sense of the hills. In my opinion, the worst hill that we’ll hit on all four loops comes just after mile 4. The hardest hills of all though will be in that extra 2.2 we tack on the last loop; these were tough in an 8-mile race, they will be a serious challenge after 23 or 24 miles. The last section also has quite a few turns; even in an 8 mile race it felt like a lot. (Although I think two of these turns were added to circumvent current construction. The Trials course is slightly more straightforward.) But as others have speculated, this will make for an exciting finish as a lot could change in those final miles. And good luck to anyone who doesn’t take the warnings seriously and goes out too hard! 2. It will be an afternoon race. 3. Atlanta Track Club is going above and beyond. Now for my race: it didn’t go so well. (Although it did serve the purpose of learning everything I wrote above!) I consider myself to be a strength runner, usually good on hills (e.g. Charlottesville, Pittsburgh) but even though I’m in the middle of Boston training (supposedly focusing on hills) they crushed me. But of course, I am in the middle of training. I took this race as a workout (at the end of a week with two other hard workouts). I felt like things were shifting and starting to come together, and hoped running this as a hard tempo run would continue to point things in that direction. I tried not to stress about it too much (It’s just a normal workout! ), but possibly that just meant I wasn’t as mentally prepared as I should have been. I went out around 5:55 pace (I think? I missed the first mile marker) with the intention to pick it up in the second half. I lost my group by mile 3 and started to struggle a bit, but was surprised mile 4 was decent (turns out it’s downhill). As soon as we hit that marker, a group of Hanson Brooks athletes passed me (they were behind me?? ), clearly with orders to pick it up after four easy miles. Or that’s what I told myself, but truthfully I just totally crumbled from this point on. I never recovered from the hill after mile 4 (above, I call it the worst on the main loop for this reason); it was like a switch flipped that I couldn’t ever flip back. I averaged 5:56 for the first four miles and 6:12 for the second four. I don’t know if mentally I just didn’t recover, if I gave up a bit too much when I realized how far off my goal I was, or what, but I couldn’t get it together and was just surviving until the finish from here on out. The final out and back under the Olympic rings was cool (although when we hit this stretch at mile 24 next year, there may be a sense of "yea yea yea, who cares”), but after that I couldn’t tell where I was going since I had fallen just far enough back I couldn’t see anyone ahead. (Not being able to see anyone also didn’t help my mental fight.) The turns slowed me more than usual as I had to repeatedly ask volunteers, “which way?” (This won’t be a problem at the Trials because of more signage, more participants, and a heck of a lot more spectators lining the roads). One volunteer told me to “Swing, swing, swing” which apparently meant turn right (in my addled mind, I was thinking it was a baseball reference: "Swing harder to drive this home???"). Fortunately she told me to turn before I idiotically almost missed it. Even in the final mile I had nothing left and couldn’t summon a kick. My stomach was beginning to revolt, but “C’mon I’m almost done, who cares? !” That’s possibly what’s most frustrating: I was trying to try, but it wasn’t working. I’m not entirely sure what went wrong, which is making it hard for me to get over this race. Things were starting to turn around and this feels like six steps backwards. I had hoped being in a race environment would help me run this workout faster than I could alone at home, but that turned out not to be the case. I know it’s just one workout, but as I head into the Rock-n-Roll Half Marathon this weekend, I wanted to have a good one to build confidence going forward. And at the moment, I can’t imagine running this course four times. Fortunately, I have a whole year to wrap my mind around it.